did the gray come from? Are there gray areas in the Bible? In today’s society we are taught to be politically correct and tolerant, there is no black and white; all is gray. Raising kids in these times is a struggle. The world is far more vocal in their life then the church. While the world agrees on some black/white issues like murder and stealing, the majority of the 10 commandments are so blurred in the eyes of the world that our children must be guarded with truth at home, church and everywhere in between. Do you remember learning the 10 commandments at church and getting an award? Again, we need to get back to teaching our children the basics. 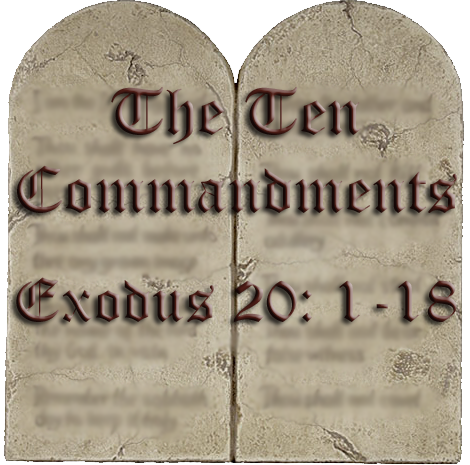 Yes, the 10 commandments are Old Testament, and we are not saved by laws but, by His grace. But Jesus taught the Ten Commandments in the way He lived and talked. Jesus said in Matthew 5:17-18, ” 17Do not think that I have come to abolish the Law or the Prophets; I have not come to abolish them but to fulfill them. 18I tell you the truth, until heaven and earth disappear, not the smallest letter, not the least stroke of a pen, will by any means disappear from the Law until everything is accomplished.” We live our lives under adherence to these laws by God’s grace. We should teach our children the 10 commandments by the way we live. 1. Do not worship other gods – What do your children see as your ‘gods’? In other words, what is your priority? Is it Self? Does mom and dad’s needs come before God or children? Career? Are you the workaholic whose main priority is to climb the corporate ladder? Money? Are you consumed with prestige and beating out the Jones, Smiths and Rockefeller’s? Sports? Are you living for the gym or sports team; skipping worship for the gym, golf, sports game? Clothes? Do you have to have the latest clothes, styles, shoes, hairstyle, manicure, pedicure? Do you spend more time on your appearance then in your quiet time? Family? Do you put your spouse and children before God? Do their wants and desires usurp His place in the family? If you allow this then you are placing them first. 2. Do not worship idols – The first commandment is about your priorities. The second commandment deals with your understanding of who God is and how to worship Him. What do your children see you use to form your view of God? The Israelites wanted visual interpretations, idols, images to help them to worship God. God says He wants us to worship Him, not through a speaker, preacher, musician, or book. Another wonderful post that every Christian should read and learn from! We often forget that children of all ages learn from our examples.